» Reviewed by William F. Deeck: WILSON TUCKER – The Man in My Grave. Reviewed by William F. Deeck: WILSON TUCKER – The Man in My Grave. WILSON TUCKER – The Man In My Grave. Rinehart & Co., hardcover, 1956. Hardcover reprint: Detective Book Club, 3-in-1 edition, February 1956. No paperback edition. It is to Rocky Knoll, Illinois, that Benjamin Gordon (Beejee) Brooks comes to check out the grave in which he is supposedly buried. The grave and the headstone are indeed extant, but he somehow feels he isn’t in the plot. After all, he argues, here he is above ground some twenty-five years after the alleged interment. The discovery of his premature burial was brought about by someone pointing out the epitaph in a printed collection of the wisest and wittiest. Besides the epitaph’s being inaccurate, Brooks claims it doesn’t scan, by which I think he means doesn’t rhyme. Still, it seems that Brooks has other graves — actually, the lack of them — in mind. For Brooks is a field representative of the Association of American Memorial Parks, and he and his organization believe that burking is rife in the area. As defined by Brooks, burking, named after the infamous William Burke, is the providing of cadavers to medical schools under suspicious circumstances, although murder does not necessarily play a role. An interesting detective in an unusual line and a somewhat frenetic investigation put this in the enjoyable entertainment class. — From The MYSTERY FANcier, Vol. 11, No. 4, Fall 1989 (slightly revised). Bio-Bibliographic Notes: While Tucker was the author of 14 novels in Al Hubin’s Crime Fiction IV, three are primarily science fiction novels, a field in which his reputation more fully lies. He became a SF fan in 1932 and won a Hugo for best Fan Writer in 1970. As a writer of science fiction, his novel The Year of the Quiet Sun was nominated for a Nebula, also in 1970. For more on Wilson “Bob” Tucker, his Wikipedia page is a good place to start. Bill was quite right about Brooks’ profession, calling it an “unusual” line of work. I’d say it was unique. And that’s why I’m sure I’ve never read this book, somewhat to my surprise. An anti-burking detective is one I’m sure I’d remember. It’s a little surprising that there was never a paperback edition of this book. If you’d like to pick up a cheap copy of THE MAN IN MY GRAVE today, it would have to be the DBC edition. The first edition is rather pricey, by which I mean in the $50 and up range. Tucker had a solid career writing mystery suspense and science fiction. One of his later books, WARLOCK, is a good mix of spy novel and esp elements. At least one of his science fiction novels, DIMENSION X, is a first class mixture of the mystery and SF genres. Was the first of these the one you were thinking of, David? From what I know about Tucker, science fiction was an avocation, a lifelong love, not a vocation by any means. He might have been able to make a living at it, but I have to agree with you, Rick, that back in the 50s and 60s, it wasn’t easy (or smart) to give up your day (or night) job. Nothing has changed for writers, Most have day jobs. Only a small few make a living at writing only. For every Patterson there are a dozen writers trapped on the mid-list or fading away. Yes, TOMORROW PLUS X. Sorry I didn’t look it up, but it was -5 here that night and the Tucker’s were in a box in the garage. It’s going on the 70’s tomorrow. Re making a living writing, for most writers it is something of a secondary occupation, with full time writers who do nothing else relatively rare. In that it is a bit like acting. The difference with writer’s however is how many find professions that are related to their dream — journalism, teaching, advertising, public relations, running a bookstore. writing may be unique among the arts in that there are so many opportunities to pursue a career using those skills. Then too, no small number of writers come to it by writing about their other professions. Sit back, watch a movie and get paid for it, you mean? I could live with that. Wilson Tucker was a fine writer and his mysteries are worth searching out. Unfortunately, many of the later ones were only published in hardcover in the Doubleday Crime Club series. As someone mentioned before THE WARLOCK (1967) is very good and I also liked LAST STOP (1963). 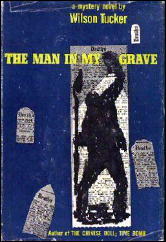 I stumbled on a hardback copy of THE MAN IN MY GRAVE years ago, cheap even though autographed. A very enjoyable read. My favorite Tucker novel is the THE LONG, LOUD SILENCE (1952), one of the best post-holocaust novels. I met him only once at a Baltimore World Con and enjoyed my conversation with him. A true gentleman.